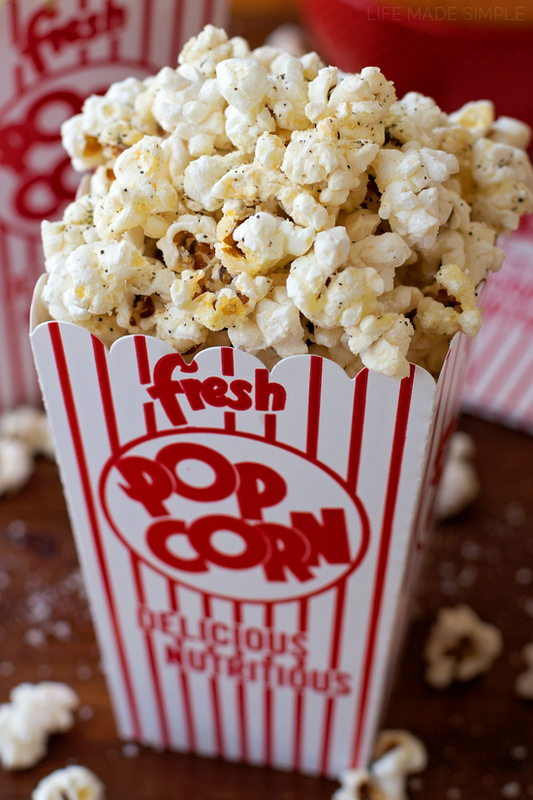 Happy National Popcorn Day! 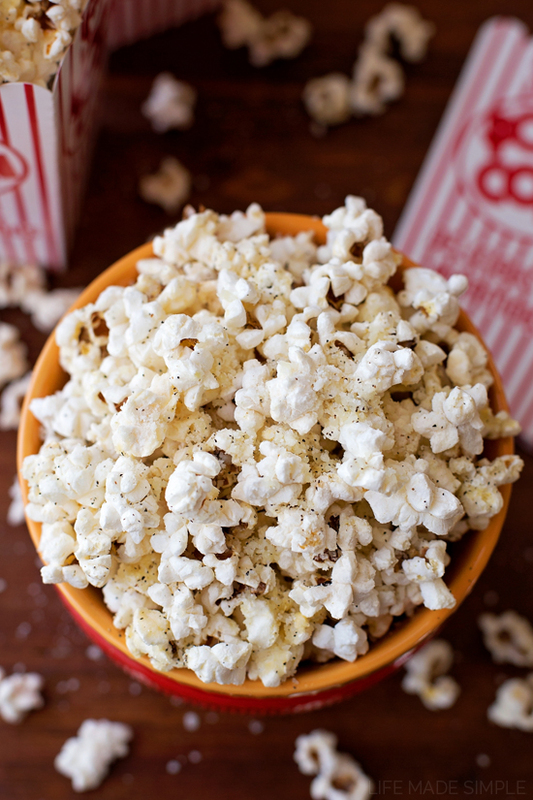 We’re celebrating by popping a big bowl of this black pepper parmesan popcorn- it’s a family favorite!! 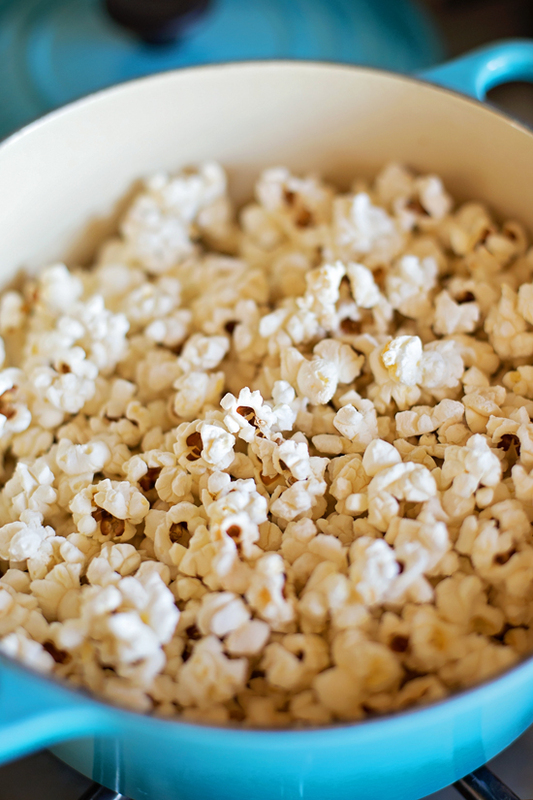 With just 6 simple ingredients you can turn plain ‘ole popcorn into something absolutely delicious! A few months ago our family made stovetop popcorn for the first time. Our toddler’s eyes lit up as each kernel popped. Needless to say, we’ve been doing popcorn each and every Sunday since! 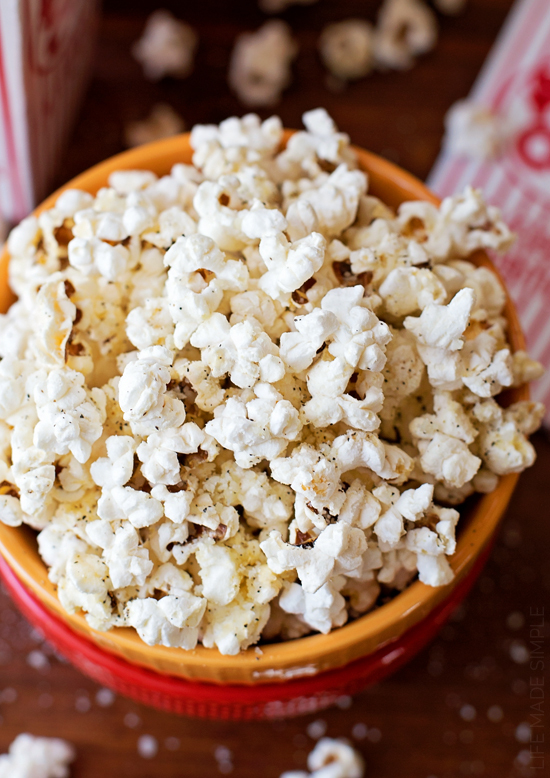 Usually we stick to the traditional butter & salt, but this time we shook things up a bit by adding a generous amount of black pepper and parmesan to the popcorn after it was popped. Guys, it was soo good! It tasted really similar to the pre-popped bagged kind I really love. And it was super easy. BONUS!! We gobbled down the entire bowl within a matter of minutes… which is probably a good thing, because this popcorn doesn’t last very long (with the fresh parmesan). 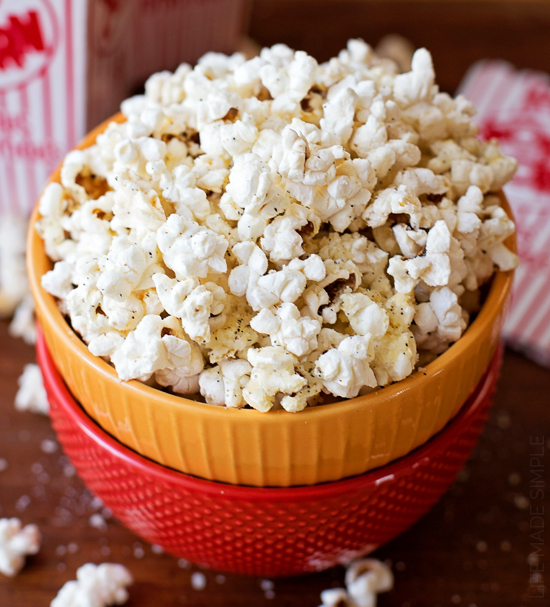 Next time you’re having a party, a family movie night, or just feel like popping some popcorn, you’ve gotta try this recipe. 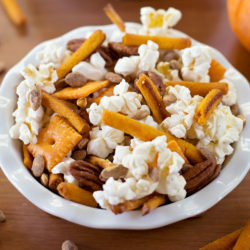 It’s simple, flavorful and takes little to no time to make! Enjoy!! ???????? 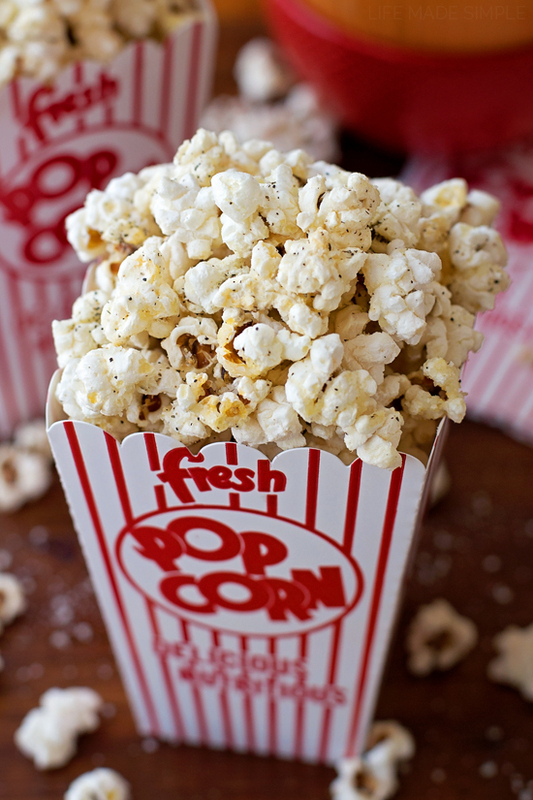 Spice things up a bit with this homemade stovetop black pepper parmesan popcorn. It only requires a few ingredients and less than 10 minute to make!! Set a large Dutch-oven or large pot over medium-high heat, add the oil. Place 3 popcorn kernels in the oil. When the first kernel pops, add the remaining kernels and cover. Remove from the heat for 15-20 seconds, then return to the heat and shake every 1-2 minutes. 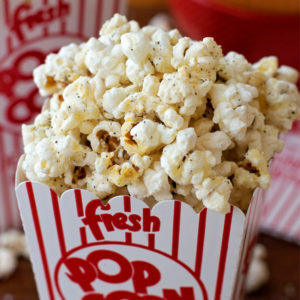 After about 3-4 minutes all of the kernels should pop. 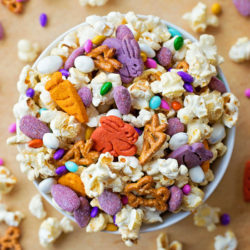 Remove the lid and pour the popcorn into a large bowl. In a small mixing bowl, combine the melted butter, garlic, salt, and pepper. 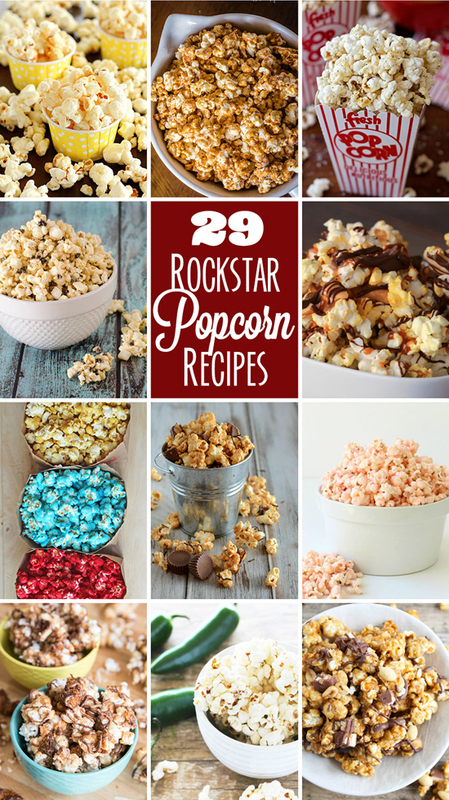 Drizzle over the popcorn and stir to combine. Sprinkle in the parmesan cheese, tossing as you go. Enjoy immediately. *Depending on how salty your parmesan is, you may not need to add any salt. This sounds awesome! 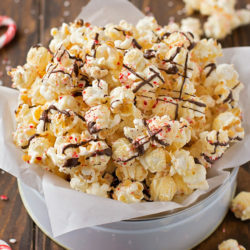 I love parmesan popcorn but had no idea it was so easy to make! I can’t wait to try this! Thanks Ashlee! It’s one of our favorites!